Dois empresários chineses pagaram milhões de dólares para uma companhia brasileira que subornou funcionários ambientais de um estado da Amazônia para exportar ilegalmente madeiraspreciosas para a China, noticia o jornal inglês The Guardian. Mas, “em um raro sucesso contra o aumento do desmatamento na Amazônia”, a polícia e os promotores brasileiros conseguiram parar o esquema antes das exportações. Os danos evitados superariam R$ 100 milhões. Foram identificados investimentos na empresa Pangea feitos pelos chineses Xiaoliang Xu e Xie Ping com a finalidade de exportar madeira em larga escala para a China. Sílvio Veriano Porto, sócio da empresa Pangea Mineração, confirmou, em depoimento, o recebimento de pelo menos R$ 10 milhões, em espécie ou em contas de terceiros. Os chineses foram denunciados nas ações doMPF e contra Xiaoling Xu há, ainda, pedidos de prisão preventiva e de inclusão do seu nome na lista vermelha de procurados da Interpol. Brazilian police foil million-dollar fraud to export precious Amazon wood to China. Two Chinese entrepreneurs paid millions of dollars to a Brazilian company that bribed environment officials of an Amazon state to illegally export precious hardwoods to China. But in a rare success against rising deforestation in the Amazon, Brazilian police and prosecutors were able to stop the scheme before exports started in earnest and said they saved the state from $30m worth of potential environmental damage. This week prosecutors presented details of two connected, year-long operations that have seen 31 people charged, including the two Chinese entrepreneurs, Brazilian businessmen, environment officials and the former head of the environmental licensing institute of the state of Amapá, on the eastern edge of the Brazilian Amazon. They said that two Chinese citizens, businessman Xiaoliang Xu and his associate, interpreter and fellow investor Xie Ping had paid Brazilian company Pangea Mineração (Pangea Mining) $3m of $15m agreed for 50,000 sq metres of wood. Police became interested in the company after an anonymous tip off and began monitoring it. According to prosecutors, Pangea used another company, Ordena Brasil, to bribe officials from the Amapá Institute of the Environment and Territorial Planning (Imap, in its Portuguese acronym) to issue “forest replacement credits” that are issued to farmers who sustainably harvest wood by replanting deforested areas. 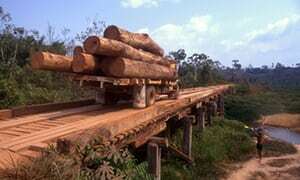 In 2014, a Greenpeace investigation found a similar system being used to ‘launder’ illegally harvested wood in neighbouring Amazon state Pará so it could be exported with apparently legal documentation. Prosecutors said fraudulent credits for nearly 84,000 sq metres were identified of which 20,000 sq metres worth had been used. It is not clear how much, if any, of the wood was actually exported. One of the suspects, Xiaoliang Xu, was charged on 10 December with racketeering and financial crimes by federal prosecutors in Amapá; his whereabouts are unknown and he has been placed on an Interpol wanted list, police said. Xie Ping was charged in October with unauthorised deforestation, corruption and racketeering. She is still in Brazil and has not been jailed. The gang illegally deforested a 6km strip of forest with plans to reach to start mining gold illegally, Bastos said. He added that Xie Ping even imported mining machinery from China. She has Brazilian residence and told police she believed all the investments planned were legal, he said. In October, Luis Costa, the former chief ofImap, was charged with racketeering and inserting false data into public administration systems. He was arrested but has since been released. Gilberto Rodrigues, Amapá’s state communications secretary, said Costa was “disconnected” from the environment agency in April this year. “The government always collaborated with the investigations from external control organs and stimulates internal control,” he said in a statement. Rodrigues said that Amapá state had suffered from a lack of federal government investments in its inspection apparatus, but said that new control mechanisms and disciplinary procedures were being introduced at Imap. Questions remain over the connections Xiaoliang Xu had been able to establish in Amapá. In February 2016, he was part of a group of Chinese businessmen who met state governor Waldez Góes to discuss investments in the state, communications secretary Rodrigues said.